The portable receiver “Pocket” is able to receive from 0 ... 30 MHz +6-meter + 4-meter with optional FM / 2-meter / DAB(+) or transceiver operation on 10 SW bands + 6-meter. Its bright display with touchscreen operation and small size / weight render it an ideal companion for demanding operators. The device possesses a 2-part casing made out of a high-strength and light magnesium alloy and an aluminum front panel. The bright WVGA display (800 x 480 pixels) with a size of 4.3” (109 mm) contains a touch panel for easy operation of the device. An additional rotary encoder in the shape of a “scroll wheel” allows for quick adjustments of set values. The Reuter Pocket contains the complete spectrum based RDR technology of the newest generation in a low power version. The integrated lithium ion accumulator suffices for about 4 operating hours with all activated functions (RX). With activated power saving functions, the operating time is considerably longer. User interface and device functionality are optimized for portable operation. A multitude of possible settings is available, normally only found in large stationary devices. The reception performance of 2x16 bit (optional, standard is 2x14 bit) Direct Sampling and spectrum based signal processing is in accordance with this appliance class, too. Blog RDR Pocket and other. 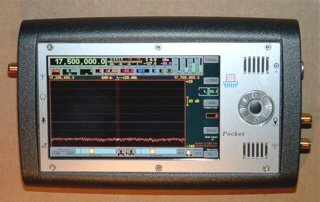 The other specifications for the Reuter Pocket are the result of the applied software. Please consult the current documentation. The WiFi driver must always be applied BEFORE the firmware update if not already present in the device! The version number of the driver is displayed as the second digit behind “LAN V0 (or 8)” in the “WLAN Access to Device” window of the update software. Attention! If the old version 1 or 2 driver is present in the device, no firmware newer as x08 may be applied! Higher versions will otherwise block access and no WiFi connection will be possible anymore!